While I might be more known to pickle everything in sight, I do tend to make a batch of jam here & there upon occasion. Jam took me quite some time to really master – somehow I was able to teach others how to do it without ever actually being successful at it myself. I know, go figure. The people that live in my house, scarred by years of bad jam, prefer to not eat the jam I make. One of them requests I purchase large tubs of just plain, grape jelly that the act of making a pb& j doesn’t use half a jar. The other has decided she’s only going to eat Daniel’s jam and when I get sneaky and reuse his jars, keeping the label and filling it with my own, she knows. This means that when I make jam, I can make what I like to eat, in whatever quantities I like, because chances are, I’m the only one eating it. 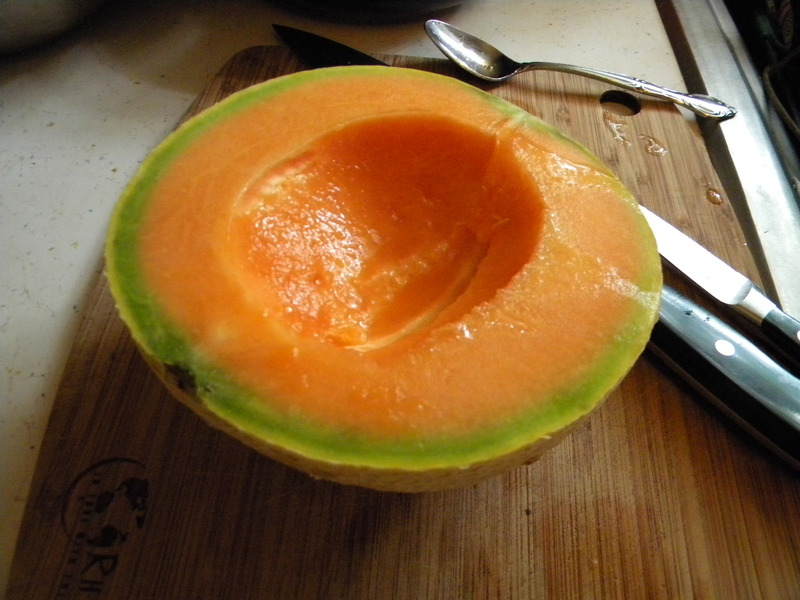 I love fresh cantaloupe. There is no better summer breakfast than a big bowl of melon and yogurt. It’s one of those things that’s hard to put into a jar and preserve it for the winter. Or so I thought. I came across a recipe for Cantaloupe Jam with Vanilla in the Food in Jars Cookbook. I was intrigued, but hesitant, given my history of bad jam. But I had to try it. While it’s not exactly the same as eating a fresh melon, it did get me through last winter just fine, spread on my morning toast. I whipped up a batch this weekend, tweaking the recipe just a bit, taking the vanilla out. 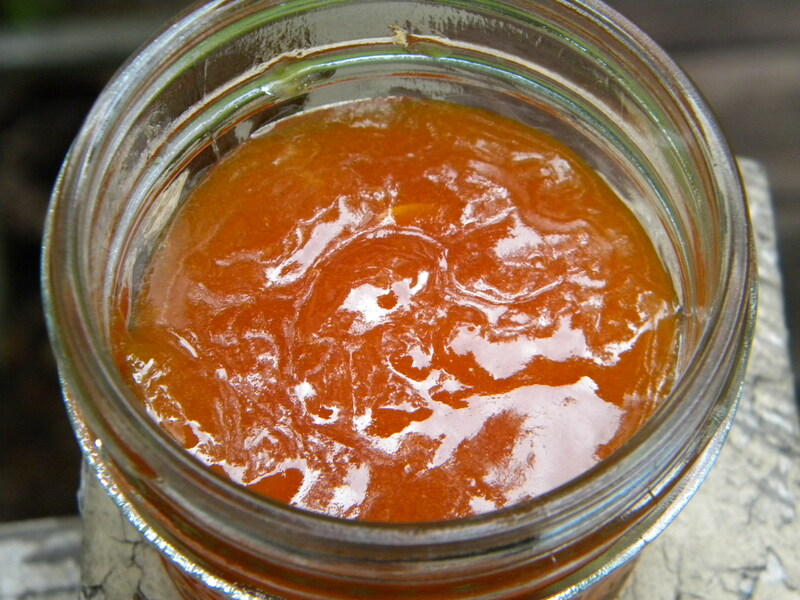 The secret to getting it to set is pectin – this may actually be the only jam I make that I use pectin. The yield was four 4 oz. jars – just enough to share a jar and keep the rest for myself. 1 medium sized melon, chopped & peeled. Combine cantaloupe & sugar in a non reactive pot. Bring to a boil over high heat and simmer until the melon easily falls apart (about 10 minutes or so). Add lemon juice & pectin and return to a boil. Cook for another 3 to 4 minutes until thickened. Ladle into jars and process in a water bath canner for 10 minutes. That would be the hardest part of making this jam. I’ve never heard of cantelope jam! You’re introducing me to all kinds of jar items this summer! Have you ever made freezer jam? It is so simple, even I can do it! I have made it, but I stick to canning it – the only thing they’ll go in the freezer for is ice cream. I have that cookbook! I am not a big fan of melon, but my mother-in-law loves it. I could make this for her as a gift, maybe. I assure you, it’s much, much easier than pickling peaches. I rather love the idea of being scarred by bad jam … like jars of bad jam run in gangs, cutting innocents on the street. That’s exactly what my jam does – runs with the wrong crowd. Damn Daniel for setting the bar so high on the jamming by you. If I didn’t like talking food geek things with him it might be a different story, but he’s a pretty cool guy, so it’s all good.